Insectivores are animals whose primary diet consists of insects, spiders and other invertebrates. This group includes bats and shrews and primarily consumes insects. Bats are separated from all other mammals by possessing the power of true flight. To escape the heat and avoid competition with birds, they are active only at night. Seldom using their vision, they rely on echo location to find prey and avoid obstacles. To echo locate, the bat emits a series of chirps and clicks from its throat. These sounds reflect off nearby objects, informing the bat of moving insects or stationary obstacles. The odd facial structures of many species aid in the reception of the reflected sound. Although the majority of bats eat insects, a few feed on the nectar of flowers. These bats have long tongues with hair or bristles on the tip to allow them to reach in to gather nectar. Thus, bats serve not only to control disease-carrying insects, but act as pollinators as well. Shrews are very small mammals which spend most of their lives underground. They have reduced eyes and rely on their sense of smell and touch to locate insects. A voracious eater, the shrew is also a ferocious hunter, for to be without food for more than six or seven hours means certain death. Being an underground dweller, they are rarely seen. 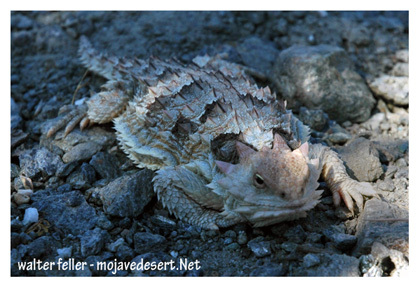 The more commonly seen horned lizard, western whiptail, and side-blotched lizards are examples of reptilian insectivores. Some may take occasional bits of vegetable matter for moisture or lack of prey. True insectivores, have slender bills adapted for grasping tiny insects, while some birds like thrushes possess more robust beaks suitable for larger invertebrates. Most insectivores will also eat at least some plant material. Many more animals live in the Mojave. Each has it own interesting adaptations for desert survival. Take the time to observe and learn about the life forms in the area. 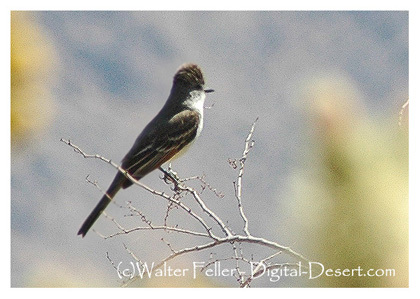 Only through close observation can the desert and its associated plant and animal life be truly appreciated.